My arrival into Brussels Airport was free of problems, unless you count getting up at 3am for a 6am flight as a problem. There are regular flights from Bristol: I booked well in advance, costing about £70 return. There are cheaper options, like a 6 hour bus from London. I'm told that's only £35 return, but I prefer the speed and convenience of a plane (if less environmentally friendly). After my train from the airport arrived at Bruxelles Noord (Centrale station is fine for this too), it was straightforward to get a train to Leuven, which will be down in French as Louvain on the information boards. Tickets were €8.80 each way, taking about 17 minutes. Checking my Sygic SatNav, it was only a 24 minute walk from the station to the BJJ Globetrotter Summer Camp at the Sportoase, but my route was immediately made easier once I saw some guys carrying their gis. The Sportoase itself is pretty big, as is the cavernous matted room where the classes were taught, deep within the building. The heat hits you straight away: I was sweating immediately upon entering the GrappleCave. I ended up doing four classes, starting with Oli Geddes' rolling back attacks. Next time, I'd like to stay for the full week and bring some Artemis BJJ students with me. Handy that I know where it is now and have experienced the process. I'd recommend bringing a very light gi. There's probably no need to book onto the meals (especially as there is open mat time during the booked eating slots). As if to punish me for complaining about the temperature, a thunderstorm hit just as I was leaving for my CouchSurfing host's house. Fortunately I had checked the weather before I left, so knew to pack waterproofs. After an interesting chat with those hosts (they're building their own house, using straw bales as the main construction material), I fell asleep pretty quickly. Friday to Sunday was dedicated to Brussels. Fortuitously, the location of my next CouchSurfing host meant that I could travel via Etterbeek station, the district listed on my birth certificate. Indulging my narcissism, I took a few pictures, but it's basically just a suburb. Apparently a well known Belgian footballer is from there, so that's presumably the only famous thing a non-Belgian would know. 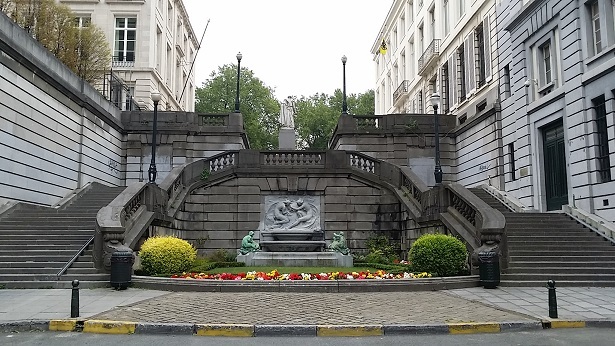 My host had to rush off to meet up with her mother in Paris, but still had enough time to give me loads of useful info about getting around Brussels. I already knew where I was heading: the museum district. Specifically, I wanted the Musées royaux des Beaux-Arts de Belgique. The translation is Royal Museums of Fine Arts of Belgium, but it sounds much better in French (be careful you don't get it mixed up with BOZAR, the Palais des Beaux-Arts, as I did at first). My guidebook said it was split into three museums, but technically it's four (although the Musée d'Art moderne is just a handful of exhibits). In fact, there are six on the Musee ticket, but two of them are outside of the main building. Getting there meant navigating Brussels public transportation, a relatively straightforward affair. Trams, trains, buses and the Metro in Brussels all connect. I started off on the 'pre-metro' line 7, heading towards Heysel, then changed at Petillon to the Metro line. Walk around the corner and down the heavily graffitied alley (you should see a big M sign) for the Metro station. There's a ticket machine if you need one, on the way to the Metro. It's €2.10 for an hour of continuous travel, or there are options for multiple trips, 24hrs etc. For the centre of town, cross over the platform (you should be able to walk straight through the gates, I think. Regardless, you can use your ticket again if not) and get on the Metro towards Gare de L'Ouest (Weststation). Alternatively, you could continue past Petillon and instead switch at Montgomery station, moving to Metro line 1. Either way, get off at Gare Centrale. From there, exit through the main Bruxelles Centrale station, continuing on through the Galerie Ravenstein (built in the '50s). Head up the posh stairs just outside, then turn right and walk to the large square, where you should see the main art gallery in the corner. The museum address, if you want to plug it into your SatNav like I did, is number 3 on rue de la Regence. There is the option of buying an €8 ticket for a single museum , or paying slightly more (€13) to get access to all of them. On my initial visit, I stuck with the Old Masters Museum (aka Musée d'Art ancien) on the top floor. Its audio guide (€4) is pretty good, full of both interpretive and contextual information, but annoyingly it doesn't come with headphones. There is what looks like a headphone port, but it was too small for my earphones. You therefore end up listening on a speaker, broadcasting to everybody else in the surrounding area. There is also a cloakroom with lockers, costing you exactly nothing (you do need either a €1 or €2 coin to operate the lock mechanism, but you get that back when you unlock it). Staring intently at every single painting, listening to all the entries on the audio guide, took me three and a half hours. I loved every minute of it. 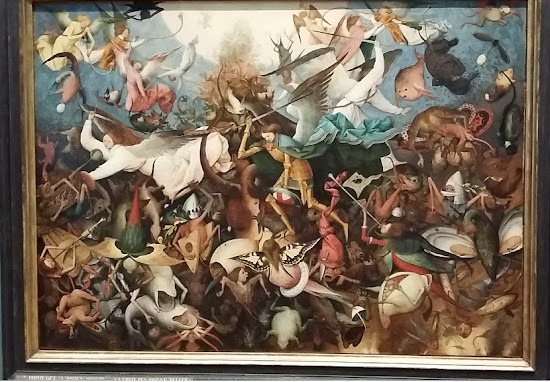 Many of my favourite artists are represented, including Pieter Bruegel (both elder and younger, along with other members of the family), Hieronymous Bosch, Rogier van de Weyden and Petrus Christus. There's the famous painting of Marat by Jacques-Louis David and an assortment of David Teniers as well. 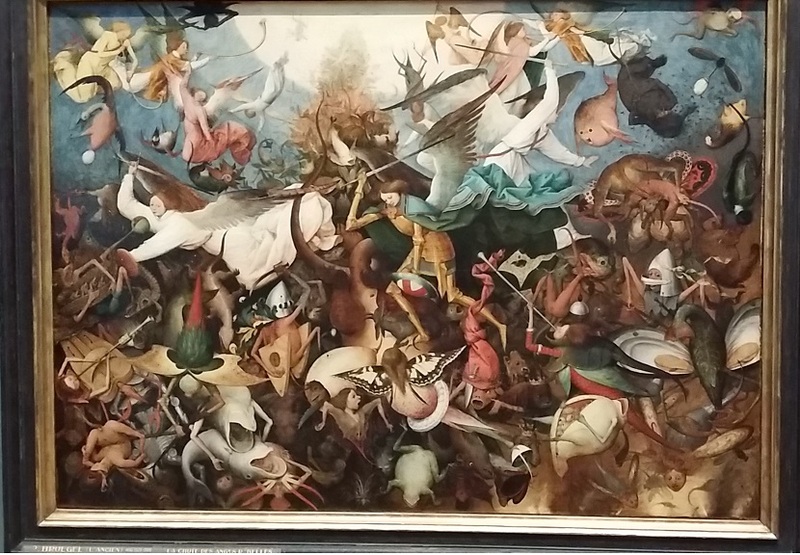 I'm familiar with a lot of the art here, especially Bruegel. The Brueghel family (Pieter, the patriarch of the family, decided to drop the H) is all over the gallery, as you'd expect given they are among Belgium's finest exports (although they wouldn't have called it Belgium in the sixteenth century: that country only came into being after the revolution of 1830). If you've read my babbling about art before, you'll know my favourite period is quite narrow, from 1450-1750 or so, meaning that once the collection moved towards the 18th century, there were more surprises. For example, a painting of what looks like a female Hercules, sadly not covered by the audio guide. I forgot to take a picture of the caption, but I think this was either 17th or 18th century. It's housed in a section away from the main square of corridors that house most of the Old Masters: the highlight is probably Rubens. I had a good chat with a fellow CouchSurfer who was staying with the same host when I got back. I had expected him to be Eastern European, given his name is Ivan, but it turned out he was from Northern Italy, which has a lot of German influence. Nice guy with lots of stories from his travels around Asia. He's finishing off seven months exploring that continent with a brief European tour, before heading home to the land of pasta. On Saturday, it was time for more gallery action at the Musées royaux des Beaux-Arts. This time, I wanted to check out the Fin-de-Siècle and Magritte sections (technically separate museums, but I got a €13 combined ticket and could therefore flit between all of them). The gallery opens an hour later on weekends, from 11:00-18:00, so I had an hour to kill before my second gallery visit on Saturday. I was especially keen to dig into the demographics of Etterbeek, something the exhibit provided with not only a map, but a video tour of Etterbeek sights too. Contrary to what I thought, there are a few things to see there, such as the Art Noveau Couchiehuis, a museum, a church and even some kind of cool medieval festival. I'll try and head along to some of that next time I'm in Brussels. Getting back to the Musées royaux des Beaux-Arts, the Musée Fin-de-Siècle was an entirely different experience to the previous day (starting with a queue: on Friday I walked straight in). I knew almost none of the artists, whereas in the Old Masters section I got to see a lot of my long-standing favourites. The audio guide this time went for depth instead of breadth: there would often be long gaps between paintings, then it would go to town on those paintings (and photographs, a major part of this section of the museum) it did deign worthy of comment. Jarringly, a video of something related would sometimes follow the audio portion of the commentary. That has the plus side of more content and benefitted from video, but on the downside you would sometimes need to sit and concentrate. 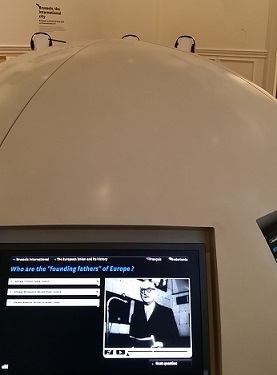 That's because the pictures under discussion might be on the viewscreen rather than in the museum. 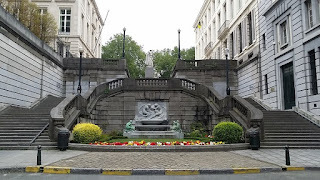 With the first entry in the audio guide, it's a whole video to watch, featuring news footage from turn of the century Belgium. 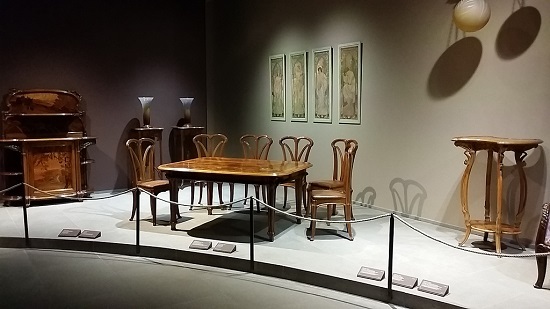 The Musee Magritte was less engrossing than I'd hoped: whereas I spent over three hours exploring the Fin-de-Siècle, I whizzed round Magritte in about an hour. I got tired of his pretentious posturing, along with the unpleasant memories of Lacan all that talk of signifiers brought up. It was essentially Dali but without the charisma. Magritte's frequent assertion that "oh, all this obviously very densely referential imagery doesn't mean anything, I just threw it together" was especially irritating. That left me with two extra hours I hadn't expected, so I spent them at the Comic Strip Museum (Centre Belge de la Bande Dessinée). 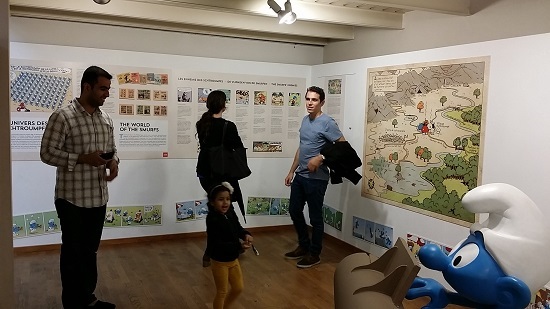 Your €10 journey starts with a history of comics, originating with hieroglyphics, the Bayeaux tapestry and illuminated manuscripts, through to Hokusai, Hogarth and eventually Little Nemo in Slumberland from the early 20th century. Lots of videos with examples are included throughout. Next up is a thorough dissection of the comic artist's craft. This display breaks down the whole process, from the initial idea through to inking, colouring and publication. There are multiple examples of original sketches and notebooks (unfortunately all in French, but as these are Belgian artists that's to be expected), along with videos giving further details. You can watch a digital artwork for a comic book being drawn step by step, very interesting for me as I have the long term goal of learning how to scribble proper pictures on my phone. Upstairs, the focus shifts to famous examples of the comic strip genre. I've never been a Tintin reader, which is the first character that springs to mind with Belgian comic art, but I do have fond memories of the Smurfs. Both had large displays, detailing their history as well as offering up sundry artefacts associated with each series. I didn't know that the Smurfs began life as essentially extras in somebody else's comic, before they gradually took over. I also got to explore a character I had not encountered before, Thorgal. He seems to be in the vein of Conan with a similar sword and sorcery setting, albeit with a heavy Norse influence. There were Thorgal graphic novels in English and French available to read, which was enjoyable enough. I like that it's an ongoing narrative for the last 40 years, rather than a constant reboot as appears to be the case with many other long running comics. When I got back to where I was staying, my CouchSurfing host had returned from Paris. I spent the rest of the evening with her and Ivan, then the next day she took us on a cool cycle tour of her city. The bikes can be rented inexpensively (though you need a credit or debit card, as they will charge you €150 if you break the bike, so want to have that security before you're allowed to take the bike) through an automated system. Compared to riding my teeny little Brompton it felt like riding an elephant, but I soon got the hang of it. Be aware that the many cobbled streets can make for a teeth-rattling experience. I flew home to Bristol in the late afternoon, still eating the €2.80 loaf of sugared bread my CouchSurfing host had recommended from her local bakery (she had loads of great tips like that). I will definitely be back, as I'm keen to return for the 2016 BJJ Globetrotters Summer Camp. My plan is to head with my girlfriend to some other Belgian cities first, then meet up with Artemis BJJ students in Leuven for the camp: I want to stay for the whole thing next time. 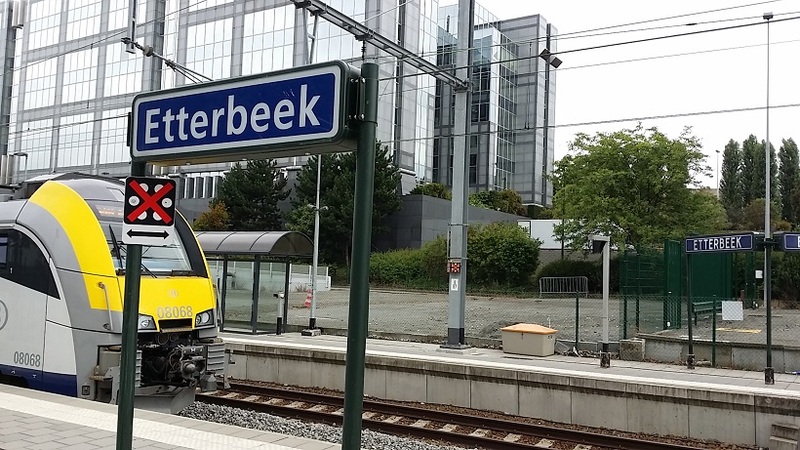 That should also give me a chance to wander round Etterbeek, hopefully learning more about that awesome Renaissance Fair type thing I saw at Experience Brussels.